From Monday to Friday, Shqiprim Salihu starts his day routinely early. At 6 a.m., he leaves his house in the village of Balaj, at times by taxi and others by carpooling with relatives, and heads to the bus station in Ferizaj. 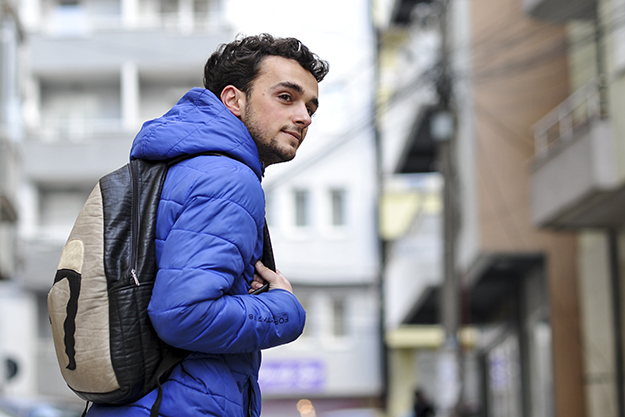 There, he boards the 6:30 a.m. bus to Prishtina in order to start work at 8 a.m. The capital is just 38 kilometers away from Ferizaj, and by car the trip can be made in around half an hour. But the 22-year-old says that the morning bus ride usually takes around an hour — sometimes more. Since he started working as a journalist in Prishtina around six months ago, he has travelled with the same bus company, but neither this company nor any other uses the brand new Arben Xhaferi highway, which has connected the two cities since the start of 2018, despite it representing one of the Kosovo government’s biggest financial investments at an estimated 600 million euros. Between 6 a.m. and 8 p.m., 14 bus companies travel from Ferizaj to Prishtina and vice versa. In total, approximately 60 trips are made, all using the smaller, pre-existing roads. Salihu believes that his travels would be easier if the highway were to be used, because it would shorten the duration of the trip. “With a car, the trip lasts around 25 minutes [on the highway], with a bus I’m not too sure, but I believe the time would be reduced,” he says. 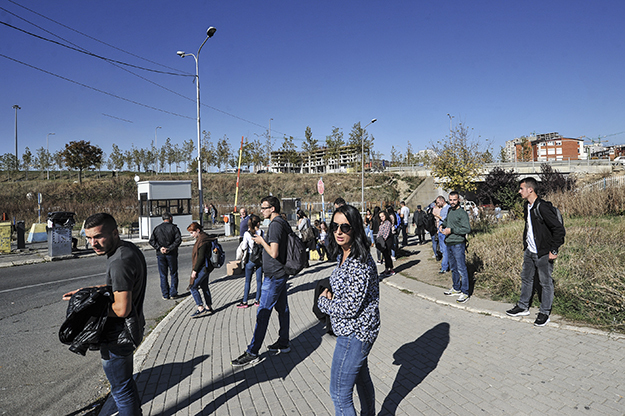 Commuter Shqiprim Salihu believes that his daily journeys would be made easier and shorter if the bus were to go along the new highway between Ferizaj and Prishtina. Photo: Atdhe Mulla / K2.0. He points out that by using the highway, buses wouldn’t need to keep stopping along the way, and they would also skip the traffic jams that they often get stuck in during their trips along the smaller roads. 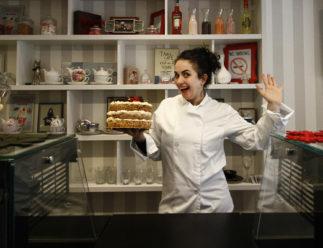 Albenita Duraku is also no stranger to spending hours on a bus each week. The mathematics student has been living in Prishtina since she registered at the University of Prishtina’s Faculty of Mathematical and Natural Sciences but regularly travels to her home in the village of Krusha e Vogël to spend weekends with her family before returning to Prishtina in time for Monday lectures. “Usually [on Sundays] at 3 or 4 p.m., I go to the village bus station and take the bus to Prizren,” Duraku says. From there, she continues to Suhareka, Shtimje and Lipjan before arriving at her final destination, Prishtina. The trip lasts more than two hours. 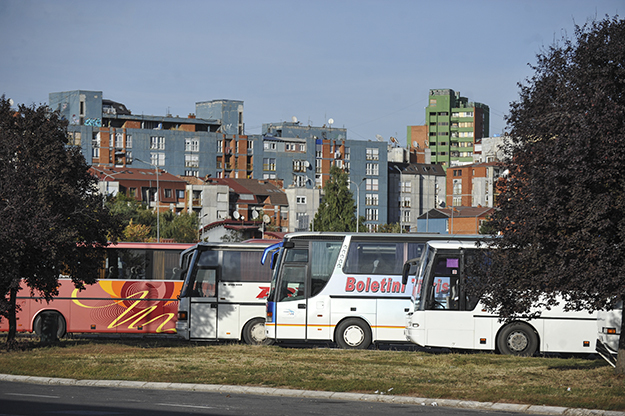 According to Kosovo Agency of Statistic, 2,326 buses were registered in Kosovo in 2018, however none of these currently use either of Kosovo’s highways. Photo: Atdhe Mulla / K2.0. Just like with the Arben Xhaferi highway, the Ibrahim Rugova highway, which fully opened in 2013 and connects Prishtina with Prizren and the border with Albania, remains unused by interurban buses despite its huge expense to the public purse. The final price of its construction has never been made public — its non-disclosure is subject to an ongoing legal dispute between NGO Lëvizja FOL and the government — but various media have suggested the figure could be around 1 billion euros. Like Salihu, Duraku believes that her weekly trip should take significantly less time. “As far as I know, the trip takes 1 hour and 20 minutes,” she says, referring to a potential bus ride on the highway. She also believes that the trip would be much safer and more comfortable if it went along the Ibrahim Rugova highway. While municipalities regulate urban transport connections within cities, trips between cities are a competence of the Ministry of Infrastructure and Transport (MIT), which issues licenses to companies, regulates timetables for bus trips and determines the roads that must be used as well as the stops at which buses can pick up passengers. Nazim Gashi, head of the Division for Policy Development and International Relations within MIT’s Department of Road Transportation confirmed that no interurban line currently goes along the Arben Xhaferi highway or the “Road of the Nation,” as the Ibrahim Rugova highway is often known. “We are in the process of analyzing lines and timetables for the Ibrahim Rugova highway, and also considering the current lines of the Prizren-Suhareka-Prishtina trip,” Gashi says, adding that MIT has “announced lines between Ferizaj and Prishtina,” but has “seen no interest” in them from interurban transport operators. However, when asked to elaborate, Gashi offers no further details as to when the call was published or why no companies applied. Haliti says that he was not aware of MIT’s call for lines that go along the highway to Prishtina, and even if he had known, he wouldn’t have applied, suggesting that using the highway wouldn’t shorten the duration of the trip. “It can’t get there earlier, because a bus can’t drive at 150 km/h,” he says. His main concern about the idea, which he describes as “backward,” is that if buses were to use the highway, it would leave many of those who live in the smaller villages along the way stranded. The reason for his concern is that Kosovo’s highways have not been built in such a way that would allow buses to stop in order to pick up passengers along the way. One of those passengers who could potentially end up without transport if the buses were all to use the highways is Kaltrina Misini, who travels on the same morning bus to Prishtina as Salihu. She hops on after the bus has already traveled for about 30 minutes from Ferizaj when the bus stops at the village of Gumnasellë. The 24-year-old has been following the same travel itinerary on weekdays for the past six years, first as a student at the University of Prishtina and in the last couple of years as a journalist. Her village has no access to the highway, and if the buses were to go that way, she says she doesn’t know how she would commute as she doesn’t currently have other options. Misini’s village is not the only settlement that would be affected if buses were to opt for the highway. There are at least seven other villages between Ferizaj and Prishtina that would be excluded from these lines and plenty more on the route between Prizren and Prishtina, with most of these buses also currently going via the town of Suhareka. Granit Zenelaj is a computer sciences student from the village of Gjinoc in the Municipality of Suhareka. On Mondays, Wednesdays and Fridays, he travels from Gjinoc to Prishtina and back. Gjinoc is between Prizren and Suhareka and has no access to the Ibrahim Rugova highway, so if the buses from Prizren were to take the highway, Zenelaj’s commute would become more complicated. “The only way would be to take two buses,” he says, explaining that he would have to go from Gjinoc to Prizren or Suhareka, and then take another bus to Prishtina. Salihu concedes that highways shouldn’t be used if this would create problems for passengers. “If [traveling on the highway] would disable people from traveling, I’m against it,” he says. However, he believes that there are other possibilities, such as opening routes that use the highways, while simultaneously providing connections that go along the “old road,” suggesting that there is enough demand to make both routes viable. “There are enough passengers [for the bus to take the highway], even if the number was to be limited only to students,” he says. He adds that the bus he takes in the mornings is almost always full of passengers from the moment it leaves Ferizaj, and that many other passengers are picked up in villages along the way. “Every day, there are people who have to stay standing up during the trip,” he says. It is not known how many passengers currently use the buses between Prishtina and Ferizaj or Prizren because MIT has yet to receive the information from bus companies that is required by law. Photo: Atdhe Mulla / K2.0. Despite the Law on Land Transport requiring public transportation operators to provide data regarding mileage, trips and passengers within a calendar year, the exact number of passengers that take this line is unknown. 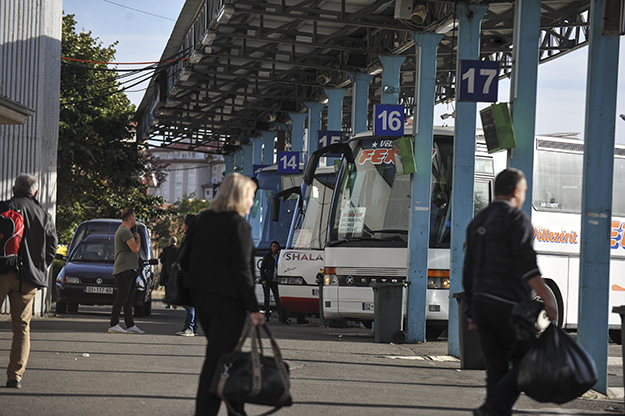 Haliti estimates that around 70 percent of his passengers start their trip at Ferizaj’s bus station, and says that there there would be enough passengers for a line using the highway to work, but he is also concerned about ruining the competition between companies. “If one company takes that [highway] line, the others would be left without clients,” he says, adding that this could cause conflict between companies. There have been numerous reports of physical altercations between bus company owners in the past, a result of existing competition over passengers. Photo: Atdhe Mulla / K2.0. In the past, there have been physical altercations between owners of bus companies in various towns and cities over competition for passengers and the best routes. In December 2017, owners of companies in Malisheva fought with each other, reportedly after one company was accused of taking passengers from another, while there have also been reports of physical fights between bus company owners in Prishtina, Ferizaj and Rahovec. 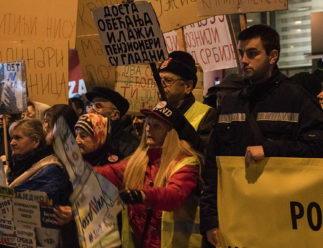 There have also been reports that Municipality officials have been attacked in relation to bus routes, with media last year reporting that the director of urbanism at the Municipality of Gjilan had twice been physically attacked by the owners of one bus company after they accused him of unjustly launching a route for another company.